ALEXANDRIA — Bernie Sanders supporters who reject the offensive, dangerous rhetoric of Republican Donald Trump and the militarism and corporate ties of presumptive Democratic presidential nominee, Hillary Clinton, have another choice. The Libertarian Party’s Presidential nominee in 2012, former New Mexico Governor Gary Johnson, will be here in Newport Beach for two events this month. The first is at 6:00 pm on Friday evening, September 26,2014, for a dinner at the Harborside Restaurant in the Balboa Pavilion, which is located at 400 Main Street on the Peninsula. The second event will be the next morning, where a boat has been charted from Davey’s Locker for a whalewatching trip. The boat will leave at 10:00 on the morning of Saturday, September 27, 2014, and the trip will take about two hours. Google Health Reform Hangout with Gov. Gary Johnson & Special Guest Dr. Jane Orient set for Tuesday, December 3, 2013, @ 7 p.m. PST/ 10 p.m. EST. 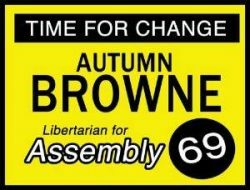 Party with Libertarians on Election Night! You are cordially invited to attend the Southern California Gary Johnson 2012 Election Nite Party, which is set for Tuesday night, Nov. 6, starting at 7 pm, at the Big Cheese Pizza Company, which is located at 3397 Mission Inn Avenue, in Riverside.